Laurel Jean's Blog: From VBS To Baptism! I’m pictured here, singing with Taylor, who accepted Christ during our Camp Lakewood VBS for blind youth. 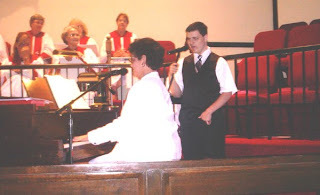 Sunday, August 9, 2009, at Grace United Methodist Church, Charleston, SC, this fifteen-year-old publicly professed his Christian faith, and was baptized by Pastor Don during the 11:00 AM service. There was not a dry eye in God’s house as T professed his faith aloud. Even Pastor Don cried along with the rest of us. Special thanks to the folks at Grace Church, who even presented T with a dramatized audio Bible after handing him his Baptism Certificate. Another special thanks to T’s great-grandparents, who are raising him. They were absolutely beaming with pride. Please continue to pray for Taylor, and for the rest of us as we nurture this beautiful, young Christian in his newfound faith! Introducing Camp Lakewood VBS for Blind Youth! Camp Lakewood Talks About Jesus. Camp Lakewood Celebrates "Resurrection Thursday"! Holy Spirit Friday at Camp lakewood!